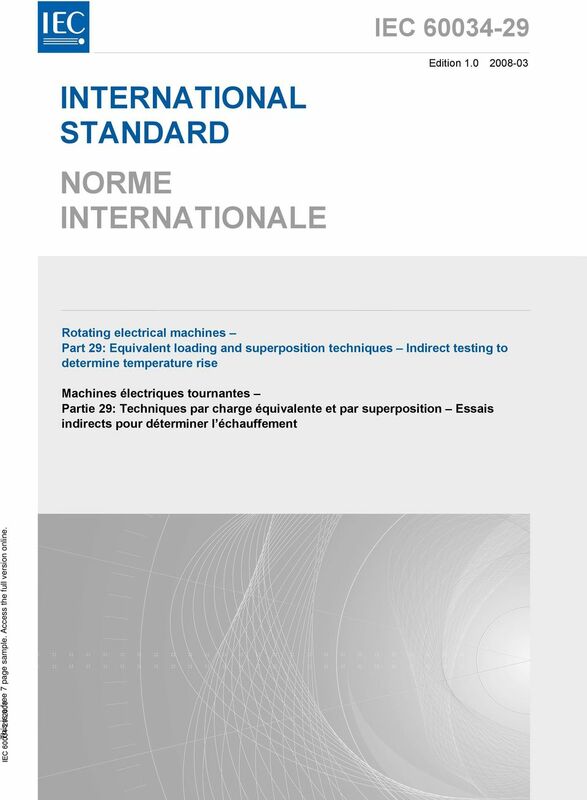 Download "INTERNATIONAL STANDARD NORME INTERNATIONALE"
5 IEC: INTERNATIONAL ELECTROTECHNICAL COMMISSION ROTATING ELECTRICAL MACHINES Part 29: Equivalent loading and superposition techniques Indirect testing to determine temperature rise FOREWORD 1) The International Electrotechnical Commission (IEC) is a worldwide organization for standardization comprising all national electrotechnical committees (IEC National Committees). The object of IEC is to promote international co-operation on all questions concerning standardization in the electrical and electronic fields. 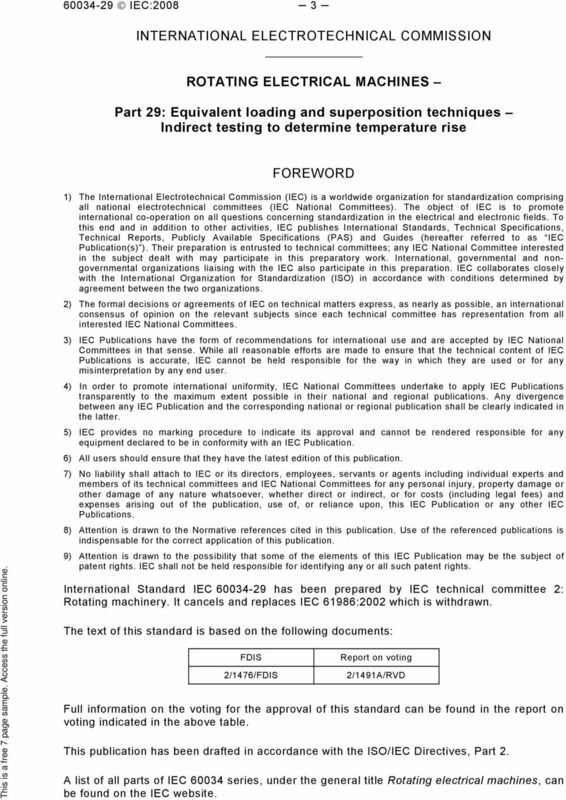 To this end and in addition to other activities, IEC publishes International Standards, Technical Specifications, Technical Reports, Publicly Available Specifications (PAS) and Guides (hereafter referred to as IEC Publication(s) ). Their preparation is entrusted to technical committees; any IEC National Committee interested in the subject dealt with may participate in this preparatory work. International, governmental and nongovernmental organizations liaising with the IEC also participate in this preparation. IEC collaborates closely with the International Organization for Standardization (ISO) in accordance with conditions determined by agreement between the two organizations. 2) The formal decisions or agreements of IEC on technical matters express, as nearly as possible, an international consensus of opinion on the relevant subjects since each technical committee has representation from all interested IEC National Committees. 3) IEC Publications have the form of recommendations for international use and are accepted by IEC National Committees in that sense. While all reasonable efforts are made to ensure that the technical content of IEC Publications is accurate, IEC cannot be held responsible for the way in which they are used or for any misinterpretation by any end user. 4) In order to promote international uniformity, IEC National Committees undertake to apply IEC Publications transparently to the maximum extent possible in their national and regional publications. Any divergence between any IEC Publication and the corresponding national or regional publication shall be clearly indicated in the latter. 5) IEC provides no marking procedure to indicate its approval and cannot be rendered responsible for any equipment declared to be in conformity with an IEC Publication. 6) All users should ensure that they have the latest edition of this publication. 7) No liability shall attach to IEC or its directors, employees, servants or agents including individual experts and members of its technical committees and IEC National Committees for any personal injury, property damage or other damage of any nature whatsoever, whether direct or indirect, or for costs (including legal fees) and expenses arising out of the publication, use of, or reliance upon, this IEC Publication or any other IEC Publications. 8) Attention is drawn to the Normative references cited in this publication. Use of the referenced publications is indispensable for the correct application of this publication. 9) Attention is drawn to the possibility that some of the elements of this IEC Publication may be the subject of patent rights. IEC shall not be held responsible for identifying any or all such patent rights. 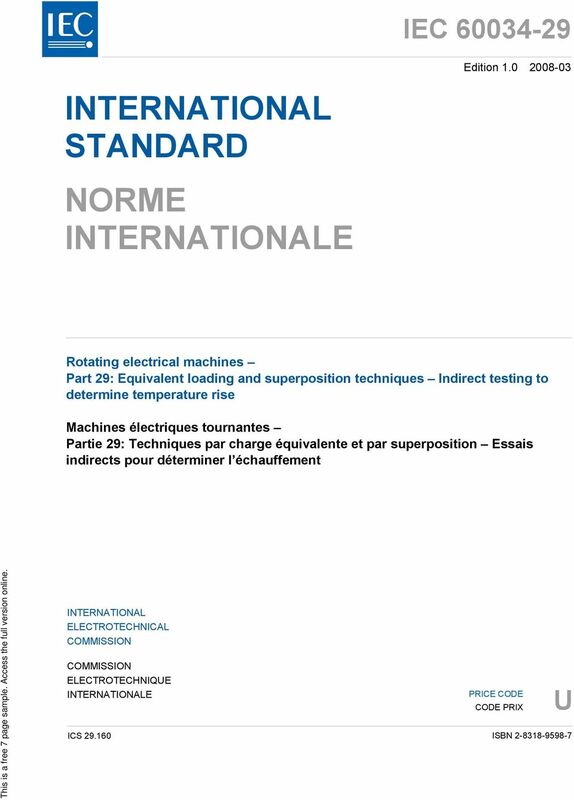 International Standard IEC has been prepared by IEC technical committee 2: Rotating machinery. It cancels and replaces IEC 61986:2002 which is withdrawn. The text of this standard is based on the following documents: FDIS 2/1476/FDIS Report on voting 2/1491A/RVD Full information on the voting for the approval of this standard can be found in the report on voting indicated in the above table. This publication has been drafted in accordance with the ISO/IEC Directives, Part 2. 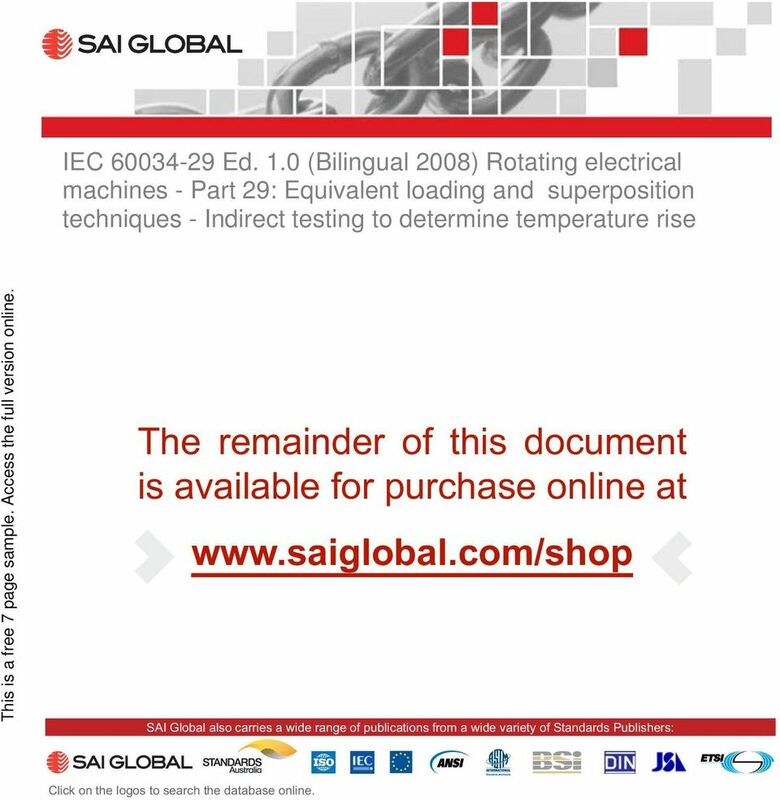 A list of all parts of IEC series, under the general title Rotating electrical machines, can be found on the IEC website. 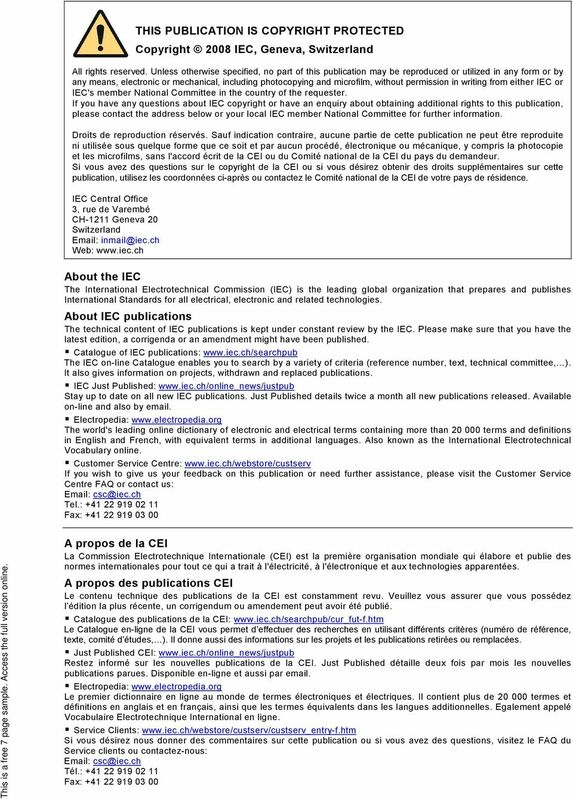 6 IEC:2008 The committee has decided that the contents of this publication will remain unchanged until the maintenance result date indicated on the IEC web site under " in the data related to the specific publication. At this date, the publication will be reconfirmed, withdrawn, replaced by a revised edition, or amended. 7 IEC: INTRODUCTION The object of this standard is to provide various indirect load tests, the purpose of which is to determine the temperature rise of rotating electrical machines, including a.c. induction machines, a.c. synchronous machines and d.c. machines. The test methods in some cases provide, in addition, means of measuring or estimating other parameters such as losses and vibration, but the methods are not designed specifically to provide such data. The proposed test methods are considered equivalent, the choice relying only on the location, the testing equipment and the machine type, and the test result accuracy. 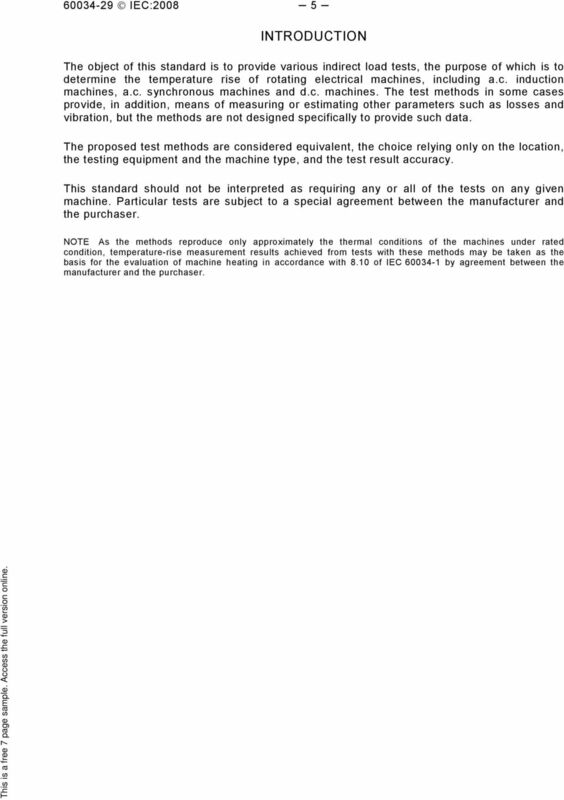 This standard should not be interpreted as requiring any or all of the tests on any given machine. Particular tests are subject to a special agreement between the manufacturer and the purchaser. 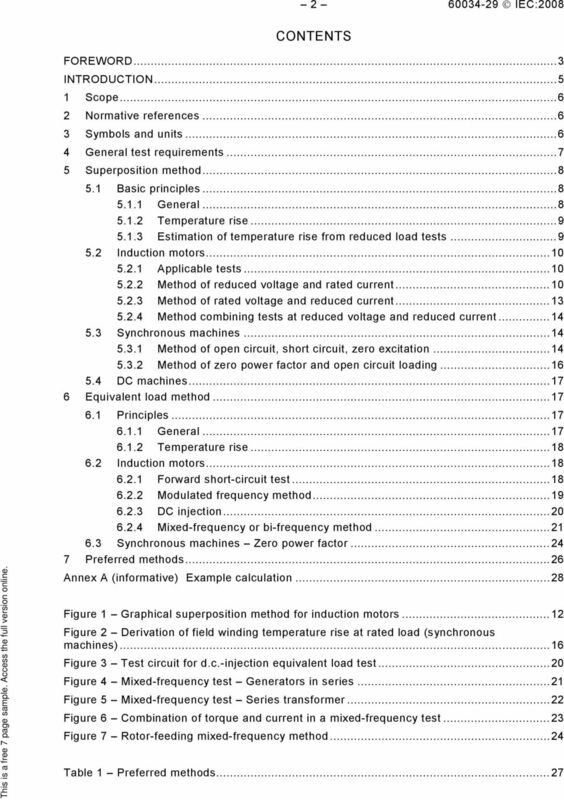 NOTE As the methods reproduce only approximately the thermal conditions of the machines under rated condition, temperature-rise measurement results achieved from tests with these methods may be taken as the basis for the evaluation of machine heating in accordance with 8.10 of IEC by agreement between the manufacturer and the purchaser. 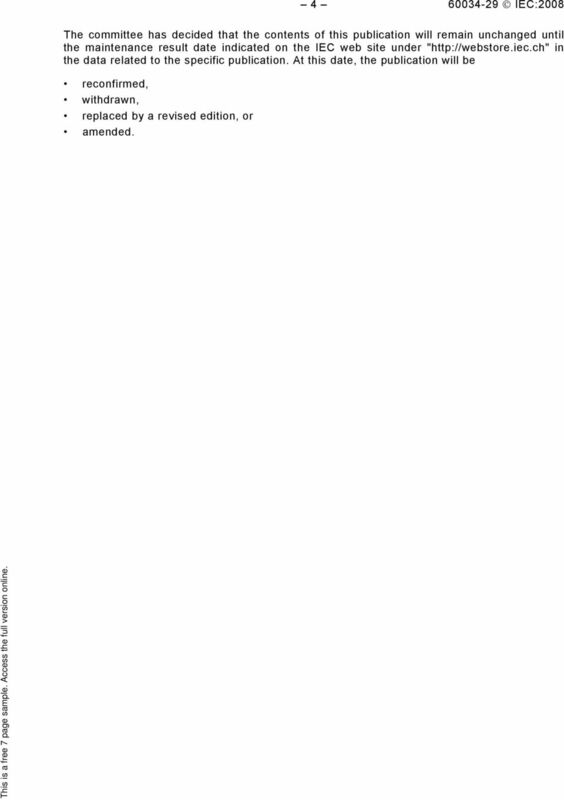 This is a preview - click here to buy the full publication NORME CEI INTERNATIONALE IEC INTERNATIONAL 60839-10 -1 STAN DARD.